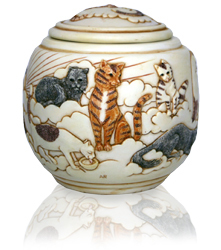 Pet urns allow you to keep your beloved pet's cremated remains in a safe wonderfully designed container. 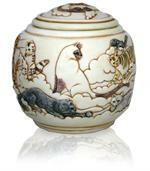 This beautiful hand crafted urn shows cats playing in the clouds on a stellar cream colored background. A perfect way to keep the memory of your pet alive and well. Every piece is hand tinted. 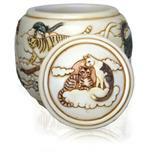 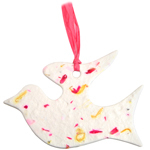 Most items ship same or next business day. 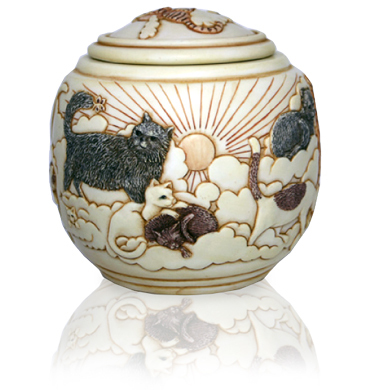 Holds 30 cubic inches or the ashes of a beloved pet that weighed 30 lbs or less at time of passing.